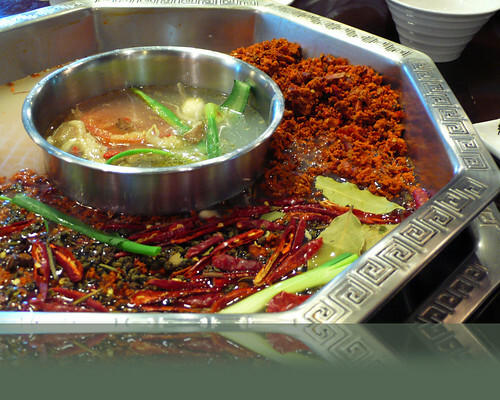 This devilish concoction is none other than the famous spicy hotpot of China. Mind you, your spice tolerance level has got to be 5 chili peppers and beyond. Otherwise you're gonna suffer. We savored this particular hotpot dinner in the city of Kunming, located in the Southwestern province of Yunnan, in the company of an old friend Qingqing. It was supposed to an authentic Chongqing-style hotpot from the ex-Szechuan province, made out of a sort of butter and lots of different spices including the tongue-numbing Szechuan pepper. Notice the little partition in the middle, that's the non spicy broth for those without an acquired taste of all things spicy. The usual practice is for a group of people to sit around a table, order numerous plates of sliced meat, seafood, mushrooms, vegetables, tofu products, cook the food in the bubbling pot and dip them in their own custom-made dips. Indeed, the highlight of every hotpot place in China is the huge buffet-style dip section. You can make you own dip with every kind of sauces, spices and herbs such as vinegar, satay sauce, cilantro, sesame oil, sesame seeds, 5 different kinds of soy sauce, and 10 different kinds of chilli paste or sauce. I was told by my chinese colleagues that the hotpot phenomenon is more of a winter get-together thing so I would suppose that hotpot restaurants would be less busy when the days get sunnier. In Shanghai, we like to frequent this less chaotic and more upscale chain - Hotpot King, at their two locations, one in the west side of the city and one in downtown. posted by *kel at 6:16 p. m.
Way too hot for my tongue but it sounds like you enjoy a version of it in SHA. Hope you are well and enjoying your life in SHA. very cool pictures you take! I love hot pots. I love especially the mushrooms. When I make hot pot, i put lots of mushrooms. If you wont mind I'd love to guide Foodista readers to this post.Just add the foodista widget to the end of this post and it's all set, Thanks! By the way, Foodista will be holding an International Food BLogger Conference, have you heard about it?